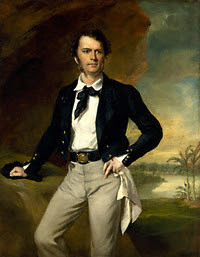 I guess I should really begin with a posting on James Brooke, the first White Rajah of Sarawak. You will find that I will jump around a bit in this blog, depending on what material I have on hand. Born in Benares, India in 1803, and schooled in England, James Brooke became a soldier and was badly injured in the First Anglo-Burmese War.of 1825. After recuperating in England, he tried to rejoin his army unit but was too late, so he made a visit to China before returning to England. When his father died, he inherited a small fortune and bought a schooner which he named "The Royalist". He sailed for the Far East and arrived in Sarawak in August 1839. On request by Raja Muda Hashim (uncle of the Sultan of Brunei), he helped quell a local rebellion, and for that he was made Rajah of Sarawak on 24 September 1841. By most accounts he was a fair ruler with affection for his subjects. He quelled piracy, tried to stop the practice of headhunting and put in place a good legal and administrative system for Sarawak. He also gradually expanded the region called Sarawak (at the expense of Brunei). James Brooke was knighted in 1847. He ruled Sarawak until his death in 1868. His nephew Charles Johnson-Brooke succeeded him. For all my postings, I will of course refer to the usual textbooks for the usual information. But I will go further and try to get information from sources which may not be as readily available. For example, I recently got hold of some (incomplete) compilations of Sir James Brooke's private letters written from before the time he came to Sarawak (the first letter was dated 7 December 1838), up until a few years before he left Sarawak for good (the last letter was on 28 September 1953). There were supposed to be three volumes of letters, but so far I've only got Volume I and Volume III. I will hunt around for the missing volume. In addition to these, I also have another smaller volume under the title of "A Vindication of his Character and Proceedings in Reply to the Statements Privately Printed and Circulated by Joseph Hume, Esq. M.P. addressed to Henry Drummond, Esq. M.P.". This was printed in 1853 and this coincides with the period where some British politicians criticised certain of his expeditions as being unfair and cruel to some of the natives. Finally, a couple of months back, I ordered an old book which comprised letters James Brooke wrote to a lady friend (some say they had a romantic relationship) named Baroness Angela Burdett Coutts. In fact Burdett Coutts also helped fund some of James Brooke's projects in Sarawak, so I think Sarawakians should know more about her and even be somewhat grateful to her. Well, I'll go into these areas more in a future posting. That's it for today. Do feedback what you think. So with these and other sources (some of which I hope YOU the reader can provide), I think we should be able to write a more complete history of James Brooke's rule of Sarawak. That painting of Sir James Brooke is the image many of us Sarawakians grew up with. But in reality, the man did not look so good I think. I've seen photographs of him and they are quite different. Ah ... James Brooke. There's even a longhouse named after him. Rh James Brooke is located about 35kms from Bintulu. Wonder why it is named after him. Can anyone research on that? you're right. dont know what the hell the Brunei Princess saw in him! Since you have his name, James Brooke's son was named Reuben or George Reuben Brooke. His descendant was in Kuching earlier this year but I haven't met him personally. He currently lives in Australia. There is a story that say this 1st White Rajah "walks on water" then my ancestor the Sultan is able to "fly"! We need to find out the date of birth of this Reuben Brooke. If it was after James Brooke's war injury, then HOW WAS IT POSSIBLE? But if it was before he went to war, then more understandable. Let me check. I believe I know the site of Rueben's gravestone. Let me see if any photos or records.